Greetings from Cal. I’m vacationing in Provincetown, MA, the first landing point in America for the Pilgrims. Plymouth often lays claim to this historically significant event, but as the locals here are quick to point out, the Pilgrims actually stopped here first before deciding there wasn’t sufficient land on which to establish a colony and moving on to Plymouth, just a few miles away. There isn’t much stretch or carnival glass to be found here today – not sure if there ever was much here, although there could have been “in the day” since this has been a tourist spot for those with sufficient disposable income to buy pretty iridescent glass to take home as a souvenir of their vacations. One thing that Provincetown has is magnificent flowers. You would never guess they have to survive the cold New England winters when you see them in all their beauty during the summer. I keep thinking how beautiful they would be in stretch glass vases, so I thought I’d share a few of these vases with you on this Tuesday Stretch. 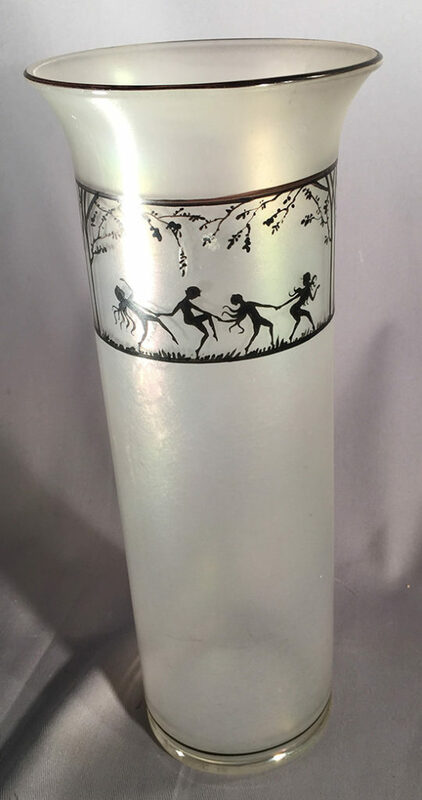 The vases with the dancing nymphs are always favorites with those of us who collect stretch glass. The nymphs are painted onto the stretch glass. I only recall black paint being used, so if you have them in some other color that would be quite interesting to see. 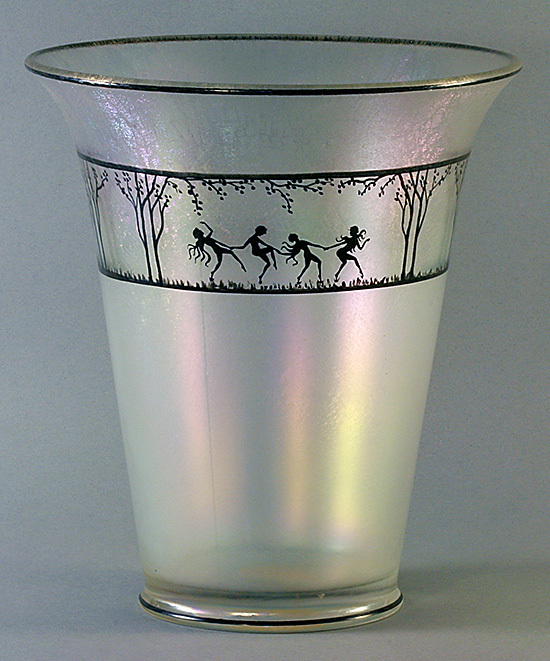 The design appears on a variety of items including a punch bowl, various other bowls and vases. Most of the items are Fenton Persian Pearl, although we know of a Diamond crystal stretch glass vase with the design. 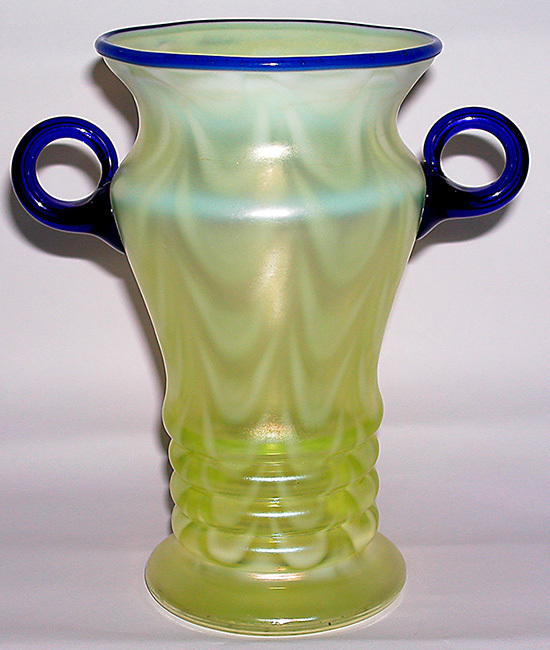 Here is the Diamond cylinder vase along with a flared Fenton vase. 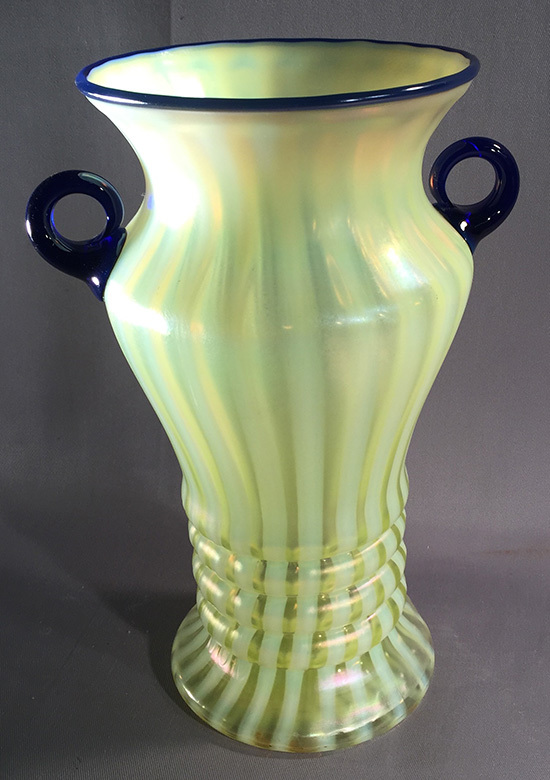 Fenton’s Curtain Optic and Rib Optic vases (and other items) are favorites of many glass collectors and it is easy to see why when you look at the form, the use of cobalt glass trim and the sheer beauty of the opalescent curtain and rib optics. These vases are available with and without handles and can be found in a few shapes. I have used mine to hold flowers from time to time; it is a sight to behold and reminds us why stretch glass was popular among those who appreciated beautiful glassware. 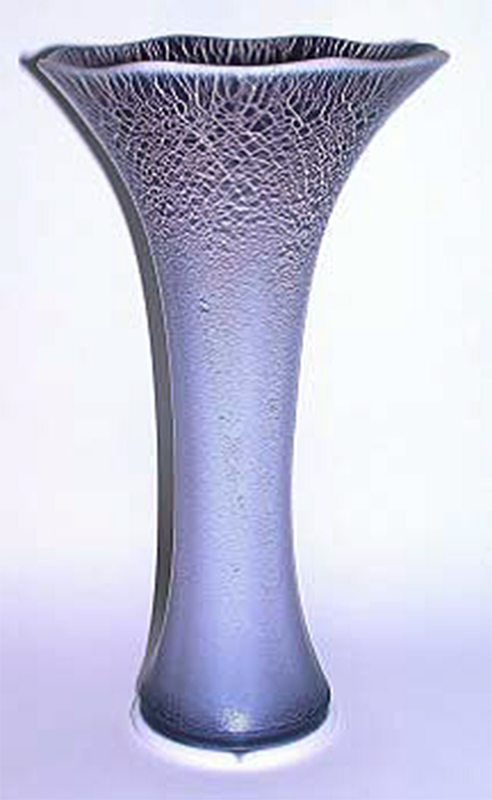 The final vase I’ll share tonight is a very tough vase to find. This is Imperial’s smoke over milk glass. This combination generally results in a very interesting ‘look’ as the iridescence adheres to the milk glass to create a very different look than is typically the case in other stretch glass. These vases are quite difficult to find and are prized by those who are fortunate enough to have one. Just imagine this vase with a bouquet of colorful flowers freshly cut from your flower garden!